Tuesday July 31, 2018 - Migori County Senatorial race is getting crowded by the day after two more aspirants joined the race as independent candidates. Solomon Hodo and Kennedy Makasembo announced yesterday that they are set for a face-off with ODM nominee, Ochillo Ayacko, in the October 8th by-election. “I have consulted my people and resolved to go it solo," said Hodo. 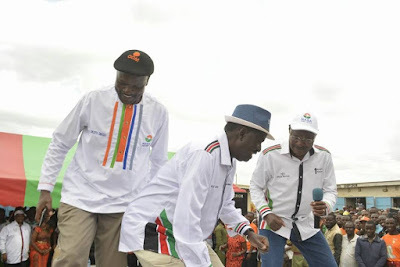 On the other hand, Makasembo, a former Kenya Union of Post-Primary Education Teachers official, expressed similar sentiments, vowing to teach Ayacko, who was handpicked by ODM leader, Raila Odinga, a lesson he will never forget. “The ballot is my last stop," Makasembo said. Former Minister Dalmas Otieno has expressed his intent to vie despite not having a party. “I am almost getting one so that I can launch my campaigns by latest next week," said Mr Otieno. The by-election will be a litmus test for Raila to gauge whether he still has the political clout in Luo Nyanza.